modern-day professional cycle racers have gone completely soft. what a bunch of namby pambies. do you think that andy hampsten was overly concerned with a drop of snow during his daring gambit over the gavia pass in 1988? and do you think it likely that the white stuff would have prevented eddy merckx or bernard hinault from fulfilling their contractual and sporting obligations? me neither. so further to my recent posting about how disappointing it was to find riders in het nosebleed riding up the smoother sections to the side of all those lovely cobbles, the next day's kuurne-brussels-kuurne was cancelled due to a 'heavy fall of snow'. and what is worse is that those who should have been responsible for cajoling these wastrels, the very men who sit in the warmth of a team car, were the very chaps who made the decisions on behalf of the cleated army. heaven's sake, it's february, it's the start of the classics season and every rider i saw during saturday's omploop het nosebleed appeared to be wearing every item of team clothing they owned. so where was the surprise that next day's weather was slightly more inclement? midst announcements of uk cyclocross races being cancelled due to snow, what on earth is the world of cycling coming to? possibly, it is coming to its senses. i for one, though delighting in watching of the hardships of the belgian classics, would not for one minute be amongst their number, especially since there is little chance that i would be amongst those fighting for victory. i would be/have been, a lowly domestique, straggling along at the back wondering what on earth i had let myself in for. and to coin a well-worn scottish phrase, it looked pretty dreich. so i think that despite the disappointment for the few and for possibly all of the intended spectators, not riding in heavy snow was probably a darned good suggestion in the first place. but what of those of us devoid of professional status, riders with little or no need to drag the colnago kicking and screaming from the comfort of its very own bike shed? despite the above underlined fact that pretty much none of us would care to venture out in such conditions (unless desperately trying to complete the rapha festive 500 before new year's eve), there are times when that inner flandrian demands to be let out to play. long-sleeve jerseys, softshell gilets, bib threequarters and neoprene overshoes are all very well for starters, but most of us are bereft of the professionals' quick-start policy, taking more kilometres than desirable to reach operating temperature. and what do we do when we've almost achieved it? that's right, we stop somewhere for coffee and cake, after which the whole process has to be gone through again. and it is at this point that the inimitable gent, morgan blue steps up to the plate. 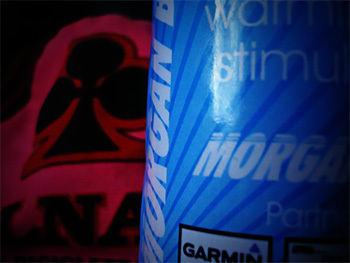 for morgan is belgian, don't you know, and has far greater experience of cancelled one-day classics than we have had carbo gels. 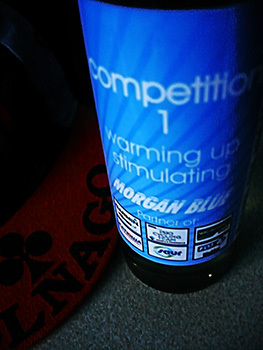 rather minimally rendered as competition 1 warming oil on the blue label (what else?) the gold coloured oil occupies a 200ml clear bottle, with the clearly marked legend on the label 'competition 1 generates heat quickly after application (no massage) and doesn't draw the blood out of the muscles to the skin, so the legs don't turn red.' and i would be doing both morgan and yourselves a disservice if i didn't concur with such a direct statement. there's a brief period of anticipation when that generates heat quickly' conjures visions of each shiny, oiled leg bursting into flames. in truth, the sensation is what i might relate as pleasantly tingly, but with sufficient warming power, that all of a sudden, riding in deep snow seems a lot less onerous than it did a few minutes previously. the instructions also allude to a typically penetrating odour, a fact that has mrs washingmachinepost and myself at loggerheads over my use of the competition 1 warming oil. to me this aroma speaks loudly of honed athlete in the house, which, midst all the sniggering, mrs twmp has singularly failed to concur. either way, its efficacy is relatively long-lasting, for not only did it provide the advertised essential warming, but continued to do so after the essential froth and carrot-cake. 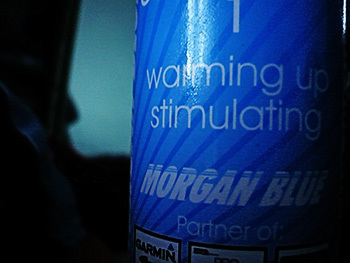 i have used morgan's warming concoction during several decidedly chilly rides so far, always with excellent results, and until the weather warms sufficiently to switch to bona-fide shorts, i will happily inhabit my alter ego as gerben de knecht, black socks and all the flandrian persona that entails. and my legs will be shiny with competition 1 warming oil. mrs washingmachinepost is wrong, by the way. honed athlete is the new black.